Hey Everybody! Hoo boy it is late right now and I am scrambling to write this post before I head off to bed. Today I'm hopping with the OSAT crew for a Fall/Halloween themed blog hop. 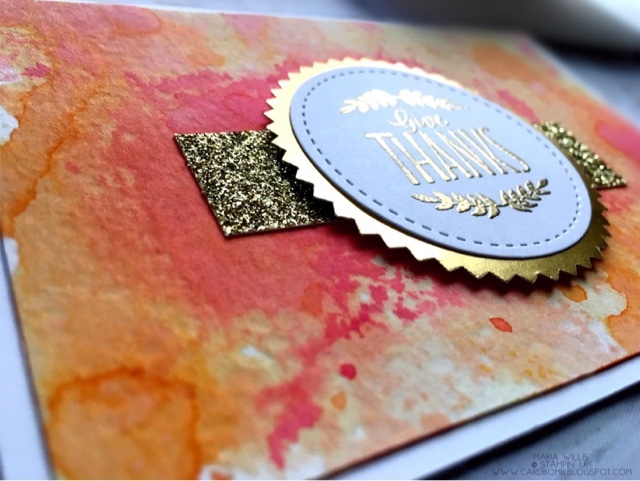 I've decided to go with Fall colors and a fall theme of being grateful/thankful... which allowed me to do a colorful card using the Ink Smooshing Technique. Sooo, guess what guys. I just finished writing this whole blog with detailed instructions on how to do this technique and somehow all of the text got deleted. Huge bummer! The problem is that it is really late and I need to get at least five hours of sleep before I head off to work tomorrow. So, I will be she of very few words for now and I will come back to update the post later in the day when I have a little time to do it properly. If my pics are all catty-wompus I apologize because I'm sure I lost my formatting when the text got deleted too. Huge apologies and thanks for understanding. I guess now we will see how good my picture tutorials are... don't judge me too hard! Lol! Start with watercolor paper, acetate and a spritzer. Smear Real Red ink onto acetate. Spritz both paper and acetate with water and "smoosh" inky side of acetate onto the paper. 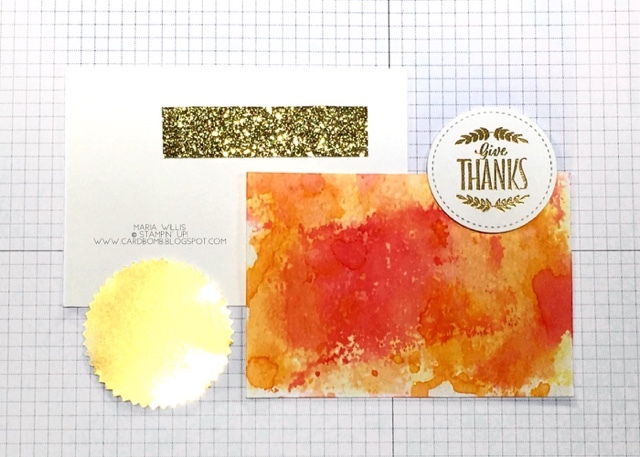 Now you will need a blank white notecard, strip of Gold Glimmer Paper, embossed sentiment and a punch of gold foil to finish the card. For my project I made a set of gift cards with a "Thank You" theme. I will be donating them to a local fundraiser with the goal of raising funds for the local Rec Center which can't open without doing some repairs. Our community could really benefit from having the Rec Center open quickly so I'm trying to do my part to help make that happen. I'll be making another set of cards or two to add to this donation. I'm thinking a box of birthday cards and maybe a box of kid's cards...what do you think? Would another theme be better or will this work? Thanks for any fresh ideas! Alright y'all! Thanks for bearing with me through this scantily detailed post. I appreciate your patience so much! I'm off to bed now (because I'm actually writing this last night) and I promise to return to update this today ASAP. 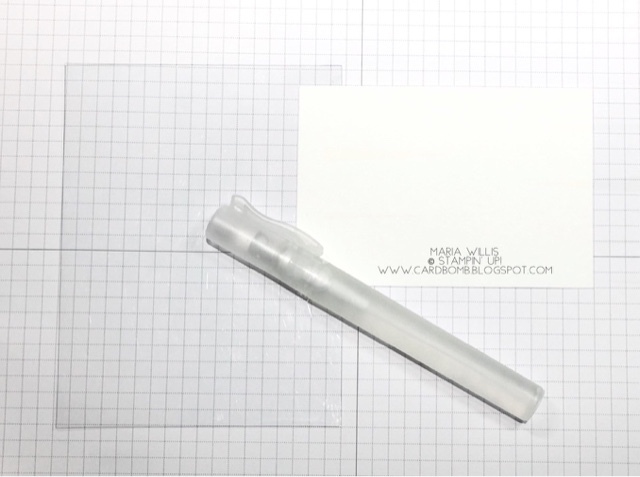 UPDATE: I've had quite a bit of feedback about this post and it seems that many people appreciate a short tutorial. I've decided to leave it as it is and instead I will soon supplement with a video tutorial. Have an amazing day and thanks for stopping by! Click the next button to see more fun projects from the OSAT crew. Ooh! I like the idea of doing a variety pack! Glad you liked the tutorial and thanks for the feedback! Great tutorial...I get it!! I have also donated cards to fundraisers. Holiday cards go over well and so do school themed/color thank yous (teachers love these). Good luck! So glad you could understand it without much writing. Thanks for letting me know. I think I will do a Holiday pack and I hadn't thought of doing school colors but that's a great idea! I could even do some with 2018 for a graduation card. Thanks for the ideas Melanie! Thanks for sharing. 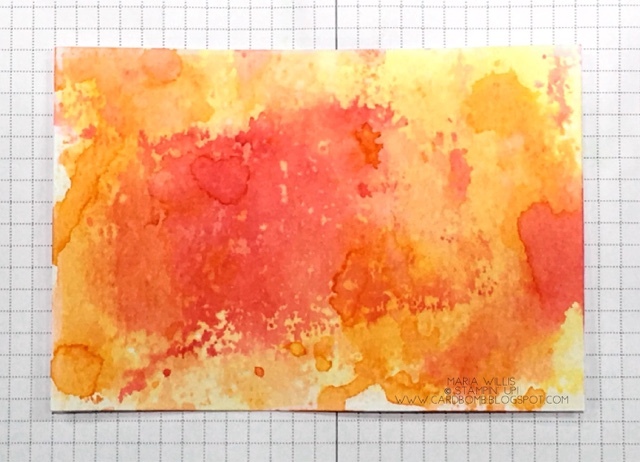 I’m going to share this technique at my stamp class next week. Thank you!! Awesome! Glad you liked it. Thank you Melody!